Red Bull Music 3Style Showcase in Elektra Events Hall buy tickets online. Delivery of tickets for the event Red Bull Music 3Style Showcase. Red Bull Music 3Style – is a world championship held among DJs since 2011. As is known from its name, each DJ presents a 15-minute set consisting of a mix of three different music styles. 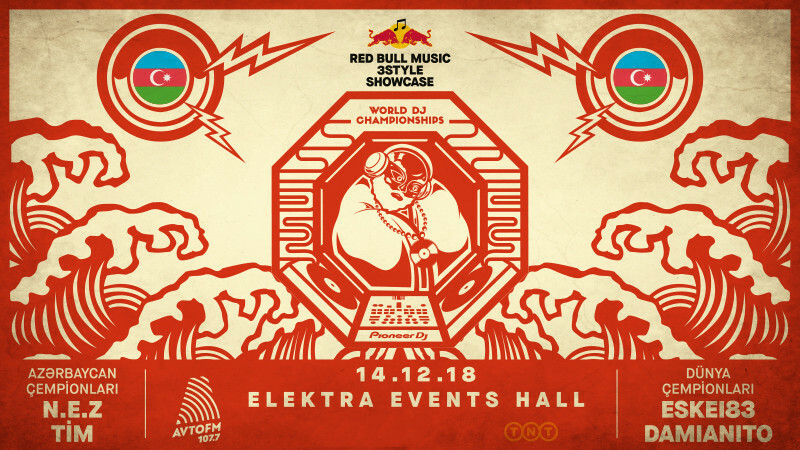 National and World Champions are going to participate at Red Bull Music 3Style Showcase, that’s going to take place in Baku. This time they will come together not for battling, but for presenting high-quality music. Damianito ( Italy ) – Red Bull 3Style World DJ Championships 8 ( 2017 ) Krakow, Poland. Eskei 83 ( Germany ) – Red Bull 3Style World DJ Championships 5 ( 2014 ) Baku, Azerbaijan. Tim ( Azerbaijan ) – Red Bull 3Style National DJ Championships 6 ( 2017 ) Baku, Azerbaijan. N.E.Z ( Azerbaijan ) Red Bull 3style National DJ Champinships 4/5 ( 2015/2016 ) Baku,Azerbaiajn. The ticket provides an opportunity of free entrance for one additional female guest. Partner of Red Bull Music 3Style Showcase– Avto FM.